The 6th International Vedic Workshop was held at Kozhikode (Calicut), in Kerala, India, from January 7-10, 2014. 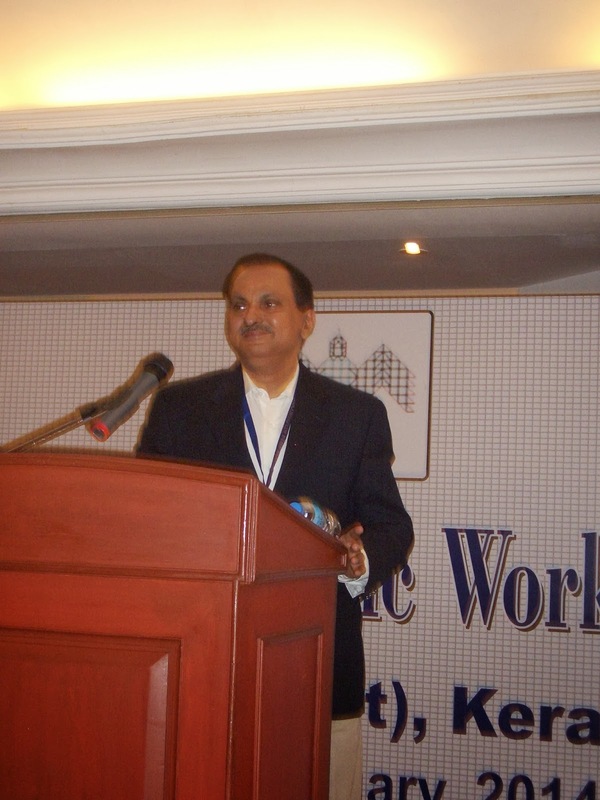 Exactly 117 persons had registered and 57 scholarly papers were delivered during these days of proceedings, see http://www.ivw2014.org/images/IVW-Program-Format.pdf. Speakers came from India, Europe, Japan and America, with about equal numbers for each of these four areas. One of the two Harvard graduate students who participated was sponsored by Harvard’s South Asia Institute, for which we are grateful. As I have experienced myself, and as I have also heard from many participants, all of us were extremely pleased by the smooth organization of the conference and of the cultural performances connected with it. The meetings were held in a cooperative and extremely friendly atmosphere that did not allow any extraneous intrusions of matters that were not linked to the four Vedas. As a result, the Workshop was held in the same scholarly manner as at any of the previous locations over the years (Harvard University 1989, Kyoto University 1999, Leiden University 2002, University of Texas Austin 2007, Centre for Eurasiatic and Afroasiatic Studies, Bucharest 2011). This scholarly atmosphere was no doubt achieved through the strict, double blind selection procedure for proposed papers, headed by Prof. Shrikant Bahulkar (Pune): neither the scholar who had proposed a paper nor its three anonymous reviewers knew about each other. Which sometimes led to the amusing situation that a certain reviewer would admonish the author of a proposed paper to include some recently published details – published by the very author of the paper… Thus, papers that were not philologically, culturally or linguistically supported were excluded by the judgment of the reviewers, and we could enjoy a proper, scholarly conference. During the workshop meetings papers were delivered smoothly, without any untoward interruption of any sort; a cooperative, civil atmosphere prevailed; in the same way, questions and answer were to the point. It also needs to be stressed that Hindutva forces did not appear that all, though there had been a little agitation since last summer, and a few internet notes appeared during and after the conference. -- However nothing untoward materialized during the workshop. 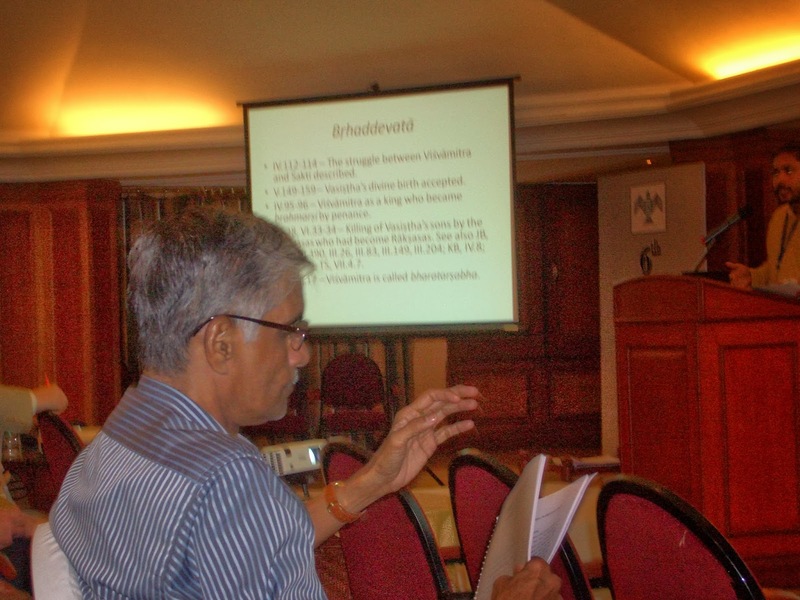 One “reformed” Hindutva writer, Dr. K. Elst (Belgium), attended the workshop. So, when I saw him, on the day before the start of the conference, giving a long TV interview in an annex of the hotel, I assumed that some surprise might be in store. However he confined himself to put 2 questions to 2 speakers, somewhat insistently and even a bit aggressively. They were easily brushed aside by the speakers, one of them Indian, the other one American. Immediately after the end of the conference he published a blog describing the workshop, while adding some comments from his point of view, again discussing the so-called Aryan invasion, which was never brought up during the 4 days of deliberations as by now it is a purely political and not a scholarly topic. My only regret is that we had so many vetted papers for these four days that some had to be presented in a parallel session. That made me miss a number of presentations I would have liked to listen to. Perhaps next time around we should limit the number of speakers and simply post, but not read out, some of the papers. Nevertheless, the papers are to be published, hopefully already in 2014, so that we will be able to read them, beyond the published summaries. It is of course impossible to give an account of all papers delivered, see: http://www.ivw2014.org/images/IVW-Program-Format.pdf. 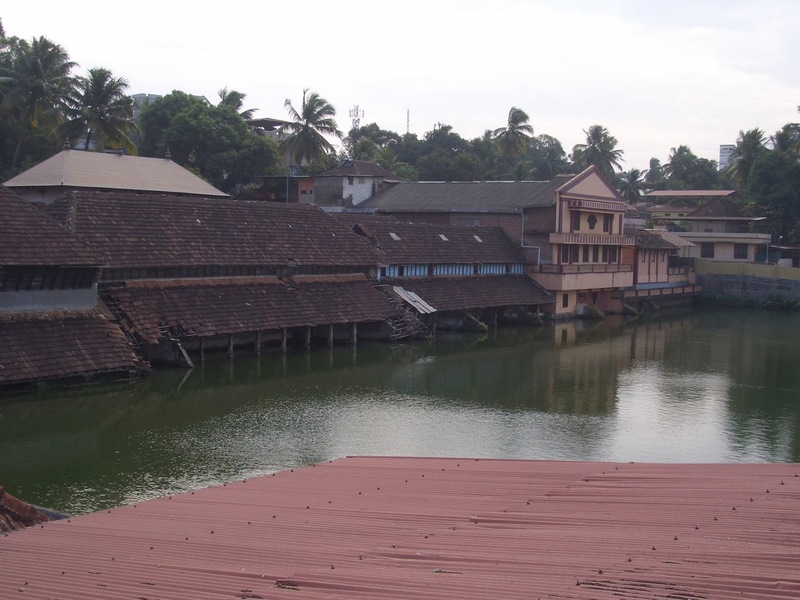 We focused on the Vedic texts themselves, their rituals, their scholarly interpretation, and their traditional performance, especially that of Kerala. In one word: the workshop was extremely well prepared and organized by the local committee, headed by its chief coordinator Dr. Vinod Bhattathiripad (www.namboothiri.com). Other members were: Dr. P. Bhaskaran Nayar, Lincoln University, UK, Prof. M. G. S. Narayanan, Former Chairman, Indian Council of Historical Research, Prof. C. M. Neelakantan, Former Professor (Veda), Sree Sankaracharya University of Sanskrit, Kerala, India, Prof. C. Rajendran, Professor (Sanskrit), University of Calicut, Kerala, India. The workshop had been vigorously prepared for many months. The committee paid close attention to all the minute details, from the selection of the venue in a comfortable hotel, to the location of the several Veda performances, to the many technical details such as computer projection, and the ready assistance extended by the organizers and their very helpful staff. Indeed, the location was congenial and the conference facilities were excellent. In depth discussions were facilitated by a handing around a microphone. Coffee, tea and lunch were served just next to the conference rooms, providing us with an additional occasion for discussion and conversation. As mentioned, we hope to speedily publish the presentations in the conference volume that is scheduled to appear within a year. This has unfortunately not been the norm for previous conferences. The Harvard volume, for a host of reasons, appeared with great delay, the Kyoto one was not published, the Leiden one was published fairly quickly, the Austin one is still in press, and the Bucharest one is now nearing completion. (It is to be published in Harvard Oriental Series, Opera Minora in two volumes). There also are plans to put all previous papers, as far as copyright laws allow, on a website designated for the International Vedic Workshops, to be maintained in Kerala. This is another laudable initiative of the coordinator of the 2014 workshop, for which we cannot thank him enough. Participants were also very happy about the cultural features presented on each of the four days: a grand Kūṭiyāṭṭam performance, a varied program of classical and popular forms of theater and dance at the Craft village, a Karnatic flute recital by Shri Kudamaaloor Janardhanan, and finally an Akṣara Śloka demonstration (of Sanskrit and Manipravaala ślokas) concatenating the Śloka of one text, recited by one participant, to another Śloka recited by a different person. The proceedings of the Workshop included, as mentioned, a visit to the Sargālaya Craft Village on the second day. Almost all prominent Veda branches (śākhā) of Kerala were brought together. We could view and listen to the recitation and performance of Ṛgveda, Sāmaveda and Yajurveda texts: that of the Śākala Ṛgveda (Kauṣītaki style), that of the Taittirīya Yajurveda (Baudhāyana), and that of the Jaiminīya Sāmaveda, sung by Nambudiris of central Kerala (Paññal) and that of an additional sub-school, the Tamil Jaiminīya Sāmaveda, as preserved at Kodunthirappilly, in the Palakkad area on the border with Tamil Nadu. The reciters of these Vedas demonstrated specimens of their individual traditions, their teaching methods, and of some of the ‘games’ that are used to ensure correct transmission. For example, for the Ṛgveda: the Muṭippacca and Paccaratha, and the vāram (Kallu vetchu vaaram). The latter recitation was performed by Dr. Naaras Ravindran Nambuthiri, Dr. Mannur Jatavedan and Kothamangalam Vasudevan Nambuthiri. 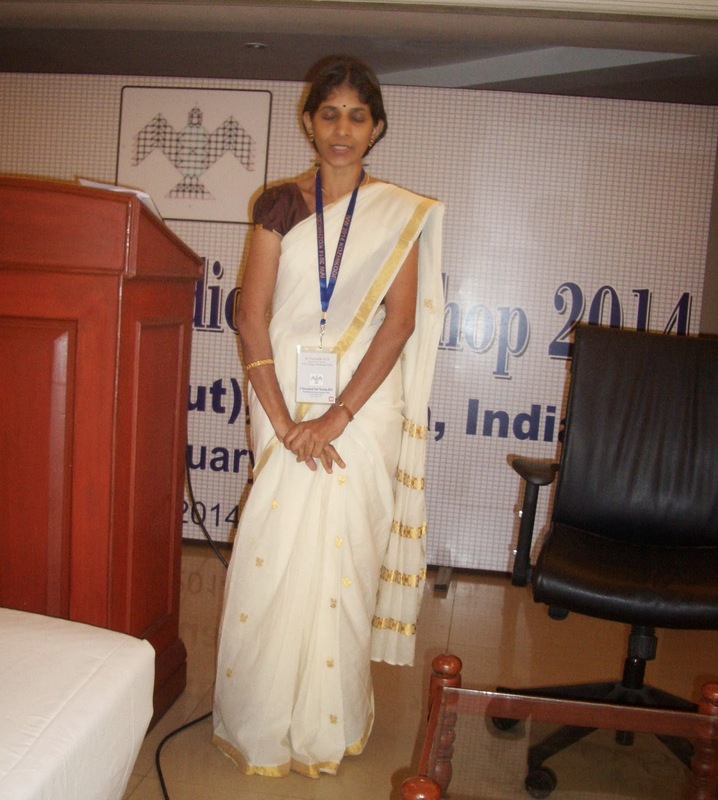 Dr. Parvathy, a Veda student of Dr. Ravindran, opened the Workshop with her recitation. She is the only female Ṛgveda reciter in Kerala. The Yajurveda in its Taittirīya recension was presented by the prominent Baudhāyanas, while the rare Vādhūla śākhā was missing. However, to my delight, I could inquire about them with the Baudhāyana Yajurveda teacher of Iriñjalakuḍa, and could actually hear and record the differences in reciting, during rituals, of the Taittirīya texts according to the Baudhāyana and Vādhūla schools; (the Saṃhitā is said to be recited in the same way). The Vādhūla recitation indeed differs somewhat from the common Baudhāyana style. It is actively preserved and taught only in two Manas in the Iriñjalakuḍa area (see the forthc. volume of the Bucharest conference). Our colleagues who work on the rare Vādhūla traditions definitely need to follow up on this particular, so far neglected aspect. Another intriguing point that we noticed was the dominance of the Kauṣītakis, who even recited the Ṛgveda portions in an Atirātra Agnicayana performed in Āśvalāyana style in 2012, at Kaimukku. The ritual procedure was based on written Āśvalāyana handbooks (Pākazhiya) of Kāpra Mana. However, in spite of the strong Vedic traditions in Kerala, unfortunately some transmissions of recitation have died out over the past few decades. (The Atharvaveda has been absent in South India for at least 500 years but has recently been reintroduced in some south Indian locations, based on its Gujarat-Maharastra-Benares tradition). The recitation by Erkkara Raman Nambudiri of the Kauṣ. Brāhmaṇa, fortunately recorded by E.R. Sreekrishna Sarma, is continued today by his disciple Naras Ravindran Nambudiri, but that of the Āraṇyaka and Upaniṣad has died out. 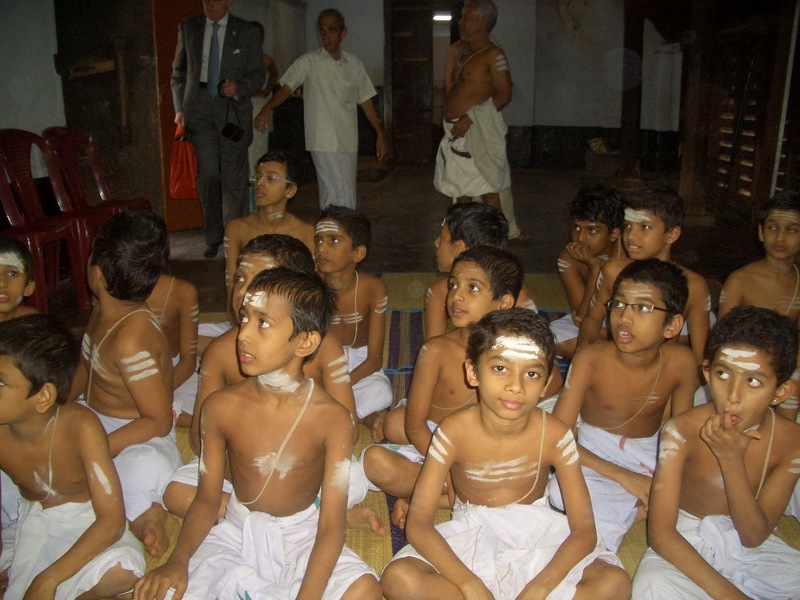 We still have to find out more details about the traditions of the Āśvalāyanas of Kerala. It is also known that around 1960 the Jaiminīya Brāhmaṇa was still recited by a Nambudiri Sāmavedin, but when the late professor K.L. Janert of Cologne finally succeeded to get a tape recorder through customs, the old man had just lost his voice and died a year later. It is a great pity that we do not have his recitation, as recitation always is better than manuscripts, and this large and important Vedic text still exists only in a rather provisional edition. Similarly, some of the texts of the Ṛgveda and Yajurveda are no longer learned by heart and recited. Thus, we definitely see a certain amount of shrinking of the ancient Veda tradition of Kerala, though this is now counterbalanced, to some extent, by tape and video recordings. There also exists a rare CD collection of the complete Ṛgveda in Nambudiri style that no longer seems to be available for sale. Luckily, I managed, through the help of a friend, to get hold of a set (and can make it available). CD disks of the Kerala Yajurveda, with 24 extracts, also exist. The workshop was followed by a “cultural tour” (http://www.ivw2014.org/Cultural_tour.html), efficiently and expertly lead by Dr. C.M. 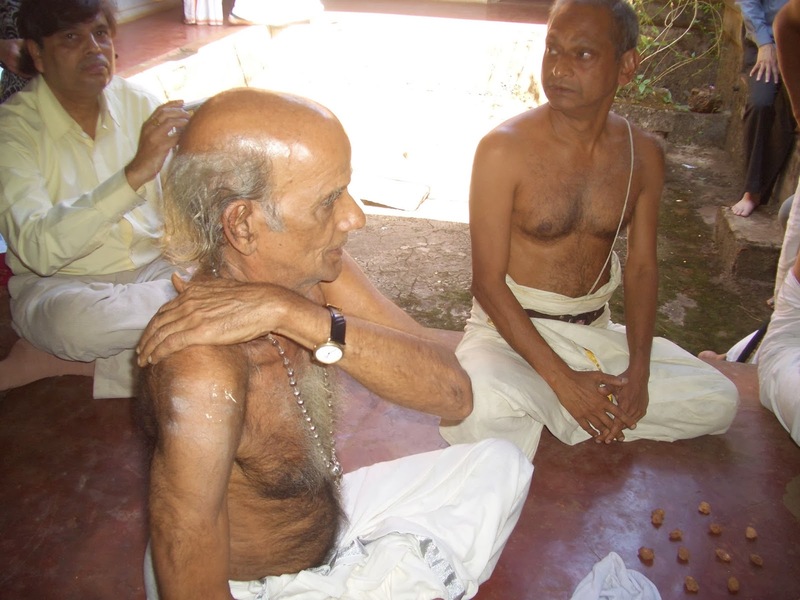 Neelakantan, a Nambudiri Ṛgvedin and Veda professor emeritus of the Śaṅkara University at Kailady, Kerala. 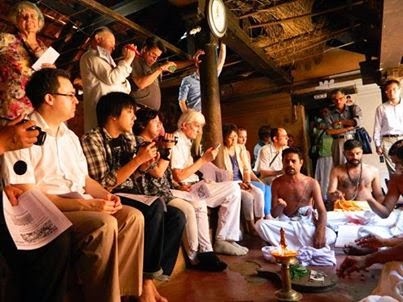 The tour brought us to various Brahmin villages in central Kerala, where the traditional way of Veda teaching and the performance of certain Vedic Śrauta rituals has been continued until today. I must underline that we were extremely well treated at all locations, with our Brahmin hosts coming forward without any hesitation to show us their houses, traditions and demonstrating their Veda learning. All provided us with tasty lunches, served in the traditional style on banana leaves, and tea as the case may be. We are very grateful for their unparalleled hospitality and their willingness to recite and sing their texts for us. On the first day of the tour we paid a visit to Olappamanna Mana near Palakkad (Palghat). http://olappamannamana.com/. We could view and walk around, at length, through this traditional Nambudiri estate and its surrounding spice gardens. A mana is a traditional complex, with several courtyards and a number of outlying houses. In Kerala tradition only the eldest son of a Brahmin married a Nambudiri woman, inherited the estate and lived in the compound, while the younger brothers either became ascetics, or more commonly entered into a marriage-like relationship (sambandham) with women from outside their own caste. They usually were interested in and furthered various traditional arts of Kerala. At this mana, we were treated to a (very) loud, one hour performance of a local ensemble, Thaayambaka, consisting of several drum players. That impressive onslaught of half a dozen drums, talking to each other, produced some lasting ear trouble for some members. The drummers must have permanently damaged ears… However, I escaped by politely putting up my arm, hand to cheek, holding one ear, but finally could not resist putting an earphone into the other. I escaped without ringing ears. In the afternoon we witnessed an elaborate Kālī pūjā in Tantric style, called Kalam Ezhuti Paatu. A colorful “sand” painting of the deity gradually emerged as it was drawn on the ground by using many types of colors, in a style resembling Tibetan and Navajo sand paintings. After the end of the ritual the image was quickly erased, just as in Tibetan ritual. (2) The next day we proceeded to the village Kodunthirappilly, near Palakkad, where Tamil Brahmins have settled long ago and still preserve their unique style of Jaiminīya Sāmaveda singing. They demonstrated several examples, with some older members of the group singing by rote while most others referred to their handwritten copybooks. In one house we were shown pictures of their ancestors: in one of the frames there was a small photo of Sāmaveda specialist Wayne Howard (Winona, MI) who had visited the village decades ago. From this village near the borders of Tamil Nadu we retraced our steps and visited several Nambudiri settlements in central Kerala. The next place was the Jaiminīya Sāmaveda village of Paññal, near Cheruthuruthi, where the 2011 Atirātra ritual had been held that some of us, presently or previously at Harvard, could visit. Unfortunately a member of the family had died a few days earlier and so there was no Sāmaveda performance. 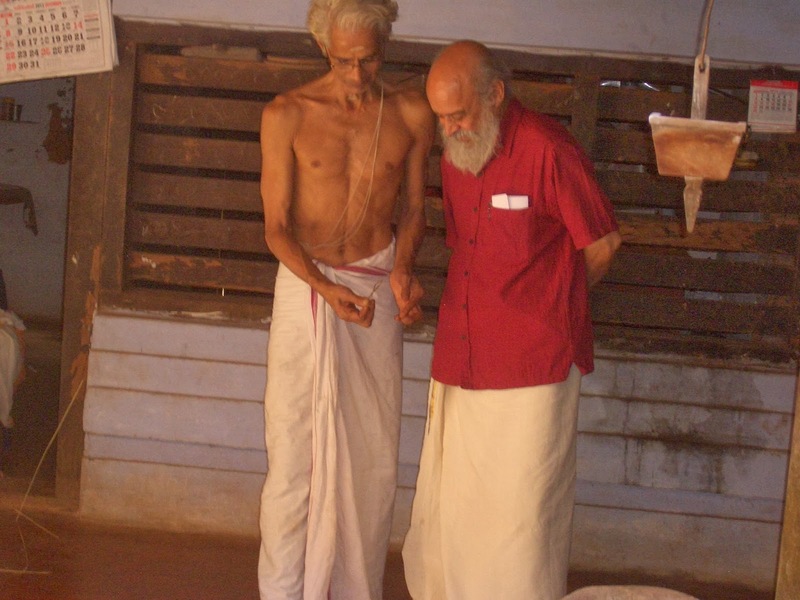 (3) Thrissur Brahmasva Madhom and Kaimukku Mana. The next days we visited the famous Brahmasva Madhom at Thrissur, took an extended tour of this old institution and could witness Ṛgveda, Yajurveda teaching and recitation. 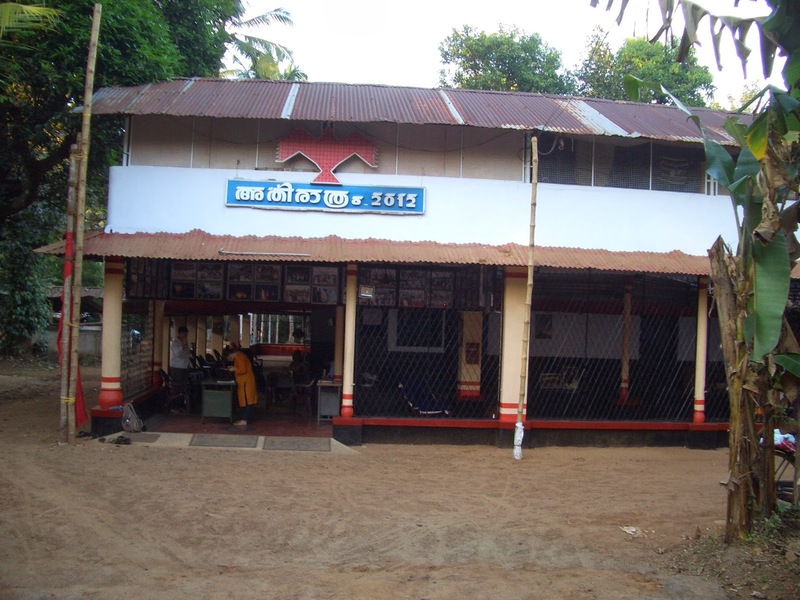 The Madhom is one of the three traditional centers of Ṛgveda teaching. Nowadays the Yajurveda is also taught there. At present there are some 2-3 dozen students for each Veda. 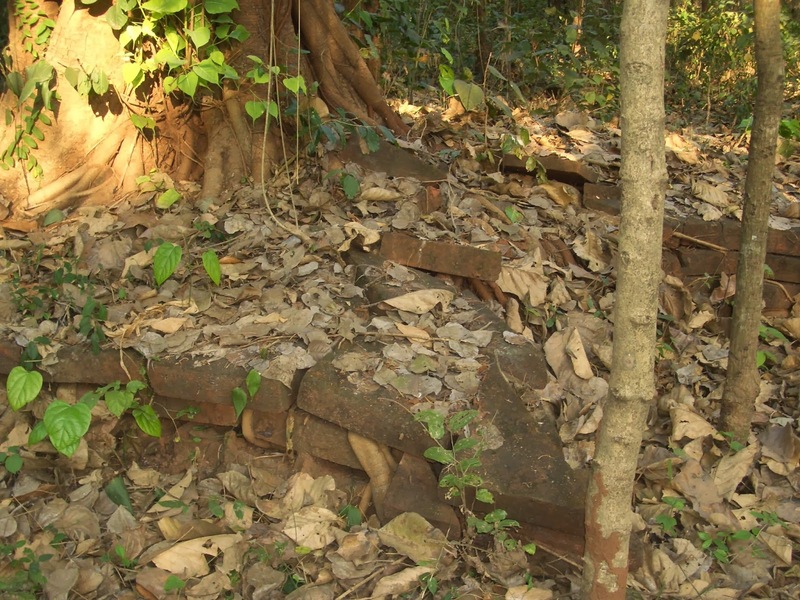 In the afternoon we visited the Kaimukku mana, where we could see the remnants of an Atirātra Agnicayana that had been performed in the time of our young local guide’s great-grandfather. The ritual ground, in a field a little distant from the mana, is now completely overgrown. A tree emerges from the body of the Agnicayana altar, but its tail could be made out clearly. So does Vedic archaeology develop. (For an attested case see the nearly two thousand year old yūpa pole found in the Yamunā near Mathura: it has been preserved as it was replicated in stone). The same was true for the 1956 one at Paññal, where several trees have grown from the body of the altar, now situated in a newly sprung up forest. However, the fire altar of the 2011 ritual at Paññal has been completely taken down, and the offering ground has reverted to a rice field; only a well belonging to the ritual ground is preserved. 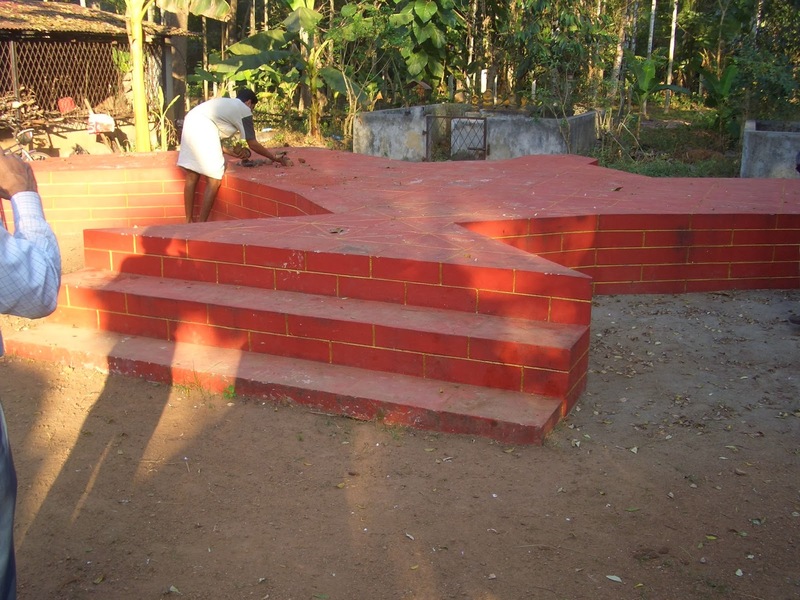 By contrast, at Kaimukku, the altar of the 2012 Agnicayana has been laboriously reconstructed in the courtyard of the mana, painted in crimson red. 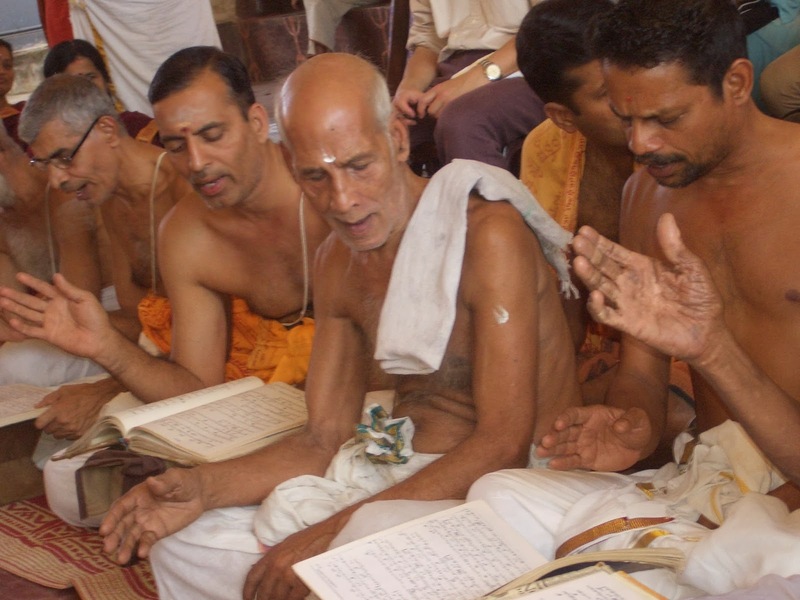 Kaimukku Raman Akkithiripad has performed this Atirātra in March 2012 with the recitation and singing of the Āśvalāyana Ṛgveda, Jaiminīya Sāmaveda and Baudhāyana Yajurveda (while using the Pākazhiya Caṭṭaṅṅu of Kāpra Mana, though the hautra was taught by Ravindran of Naras Mana, a Kauṣītaki), In the evening, at sunset, we could also witness a performance of the Agnihotra. For many participants this was the first time they could witness this hoary fire ritual Agnihotra, and they eagerly filmed the proceedings. (4) The next day we moved on to Naras mana (near Edappal, Malappuram district), where we could view various aspects of Ṛgveda chanting, lead by Dr. Nāras Ravindran Nambudiri. Apart from demonstrations of Ṛgveda recitation and teaching, a vāram was demonstrated as well. Finally we moved to Kaa(va)pra Mana and visited Kaavapra Sankara Narayanan Akkathiripad, who had performed an Atirātra in 2012, employing Kauṣītaki Ṛgvedins, Baudhāyana Yajurvedins and the Jaiminīya Sāmavedins. Now we eagerly await the next Workshop, probably to be held in Europe in a few years. Thanks for your wonderful report of the workshop and of the associated events and of your trips to various vedic sites. It was very informative and useful. Look forward to reading forthcoming blogs by you. In this blog I will comment on current writings in the fields specified under "Interests." -- However, I will neglect and will not respond at all to nationalistic/chauvinistic Hindutva attacks, past or present.